The lyric video for “Pay To Pray”, a song from the German alcohol-soaked thrash metal act TANKARD, can be seen below. The track is taken from the band’s 17th studio album, “One Foot In The Grave”, which was released on June 2 via Nuclear Blast. The follow-up to 2014’s “R.I.B. (Rest In Beer)” was recorded at Gernhart Studios in Troisdorf with producer Martin Buchwalter (DESTRUCTION, ACCUSER, PERZONAL WAR, SUIDAKRA). The cover artwork for “One Foot In The Grave” was created by Patrick Strogulski, who is a student of Sebastian Krüger, the recent artwork designer of TANKARD. He also created the cover artwork for the “A Girl Called Cerveza” and “R.I.B.” albums. With this, the iconic band mascot, the TANKARD Alien, celebrates his return after about 13 years of absence. The alien was born in 1989 with the “Alien” EP and has already graced five album covers. The TANKARD fan club “Maniac Aliens” is also named after it. TANKARD will ceberate its 35th anniversary by staging the Tankard & Friends Festival on December 29 in Frankfurt. 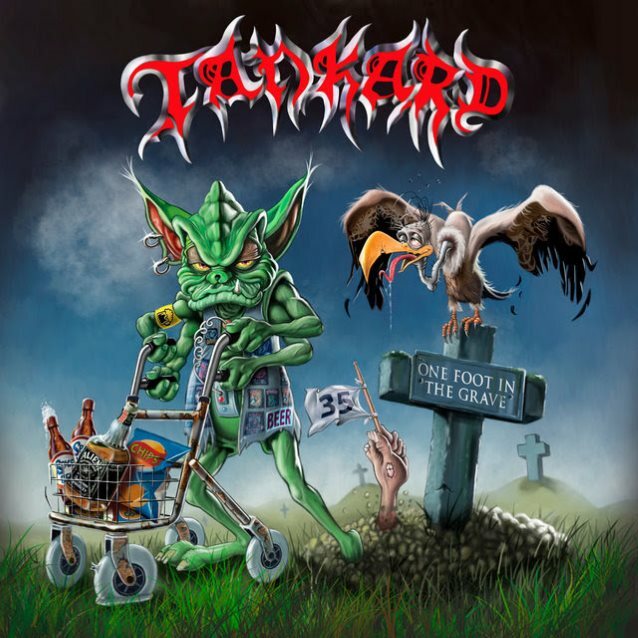 TANKARD will play a special show featuring all classics from the band’s history. Joining them at the event will be HOLY MOSES, SAPIENCY, PERZONAL WAR, SCORNAGE and PIE RATZ.